"A favorite for any holiday." Cook bacon in a large skillet over medium-high heat until crisp, about 10 minutes. Drain the bacon slices on paper towels; chop and set aside. Place potatoes into a large pot and cover with salted water; bring to a boil. Reduce heat to medium-low and simmer until tender, about 8 minutes. Add green beans to the water. Bring the water again to a boil and cook until the green beans are slightly tender, about 2 minutes; drain. Cool potatoes and green beans slightly before transferring to a serving bowl. 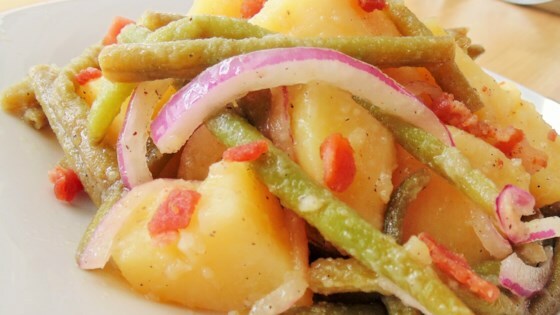 Mix balsamic vinaigrette, chopped bacon, red pepper, red onion, salt, and black pepper together in a bowl; pour over the potatoes and green beans.